We love Gen Con. We sell a lot of games, meet a lot of people, and generally have fun playing games (our own and others)! Of course, a whole bunch of people played a whole bunch of Red Dragon Inn this summer at Gen Con, including at our (in)famous RDI Doppelganger Tournament. Two rules situations came up which were very interesting, so I thought I should share them here. In a four-player game, Gerki has 7 Gold and Serena has 3 Gold. Serena plays a damage card on Gerki that will knock him out when it resolves. In response, Gerki plays “Well…I don’t see your name on it” and “Oh, this gold piece? Um… I found it… under your chair…” to steal 2 Gold from Serena. 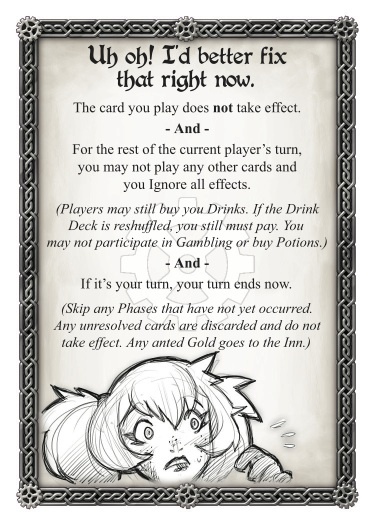 After those resolve, but still in response to Serena’s original damage card, Deirdre plays “Tip the Wench” targeting Serena to make her lose her last Gold. Back in the RDI stone age, situations like this had to be decided by house rules and general consensus. And maybe some arguing. Bleah. So, the first thing we do in this case is to fully resolve all card effects (rule 1 above). This means that after Serena runs out of Gold, we finish resolving Serena’s damage card, which knocks Gerki out. We then check to see if any players are losing. There are two players losing simultaneously, so we follow rule 2 above. First Gerki, who now has 9 Gold, passes out. 5 of his Gold pieces go to the Inn, the other 4 are divided among the three remaining players. Each remaining player (including Serena) will get 1 Gold. Now that Serena has at least 1 Gold she is no longer losing and gets to stay in the game! One of our most popular Gen Con events is our RDI Doppelganger Tournament. This format can take up to 36 players, and it always draws a crowd! In the first round, each player plays at a table of 2-4 players who all play the same character and fight it out with their “Doppelgangers”. Once we determine the “real” Gerki, Fiona, Serena, etc, the winning players move on to the second round; two randomly-assigned six-player games. The top two in each game advance to the four-player final table to crown an overall winner. Now, I should pause here in the scenario to describe that card to you the people who haven’t played RDI3 yet. Wizgille’s Temporal Dilation card is pretty cool. It allows Wizgille to Negate nearly any card in the game, BUT the person who played that card may then play another card of the same type. So, back to our scenario! Crazy, huh? In this case, though, that last bit of reminder text on the card tells you everything you need to know. A’s Temporal dilation doesn’t take effect, but that doesn’t matter. A’s turn ends immediately. All unresolved cards are discarded and the Gold in the pot goes to the Inn. It is then B’s turn. Assuming that B doesn’t Negate her own Temporal dilation (with, for example, “I don’t think so!”), it resolves. It does NOT Negate A’s Cheating card, and B cannot play any more cards. The reminder text tells us that B may not participate in Gambling anymore. Therefore, since A is the only player left in the Round of Gambling, A wins the 4 Gold in the pot, then continues with her turn. Thanks for reading! If you have any interesting rules scenarios or questions of your own, please send them to us! We hope to use some of the more interesting and illustrative situations here on this blog to help people understand the RDI rules better. Until next time, SlugFest Rules! « Black Friday Gaming Update!